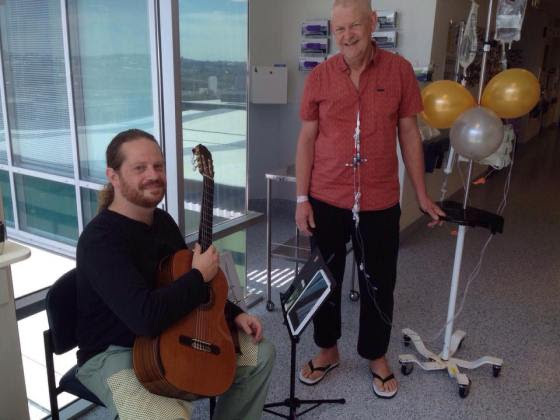 November 22, 2017 - Stairwell Project team member Ian Ahles [ Classical Guitar] with bone marrow recipient patient, Jim Usher in ward 5C, Royal Brisbane and Women's Hospital [ RBWH] Cancer Care Services [Haematology]. The little but big idea that live music performed in the open spaces and wards of a large city hospital is a positive factor in raising staff morale, improving patient recovery and reducing health care costs is gaining momentum. Documented international research is finding traction in policy and funding development while in Australia via a range of new ventures such as The Hush Foundation where live music in all kinds of combinations is being slowly introduced onto hospital campuses. The Stairwell Project's pilot project in Cancer Care Services at RBWH was part of this evolution of new aspects of health care at the RBWH from November 2017 - January 2018. We were invited by the RBWH Cancer Care Services Associate Professor Dr Glen Kennedy to apply for a small RBWH Foundation grant in 2017 following our successful experiment with live music placement in the hospital from June 2015. Six musicians from The Stairwell Project volunteered to be involved in the new pilot - to perform in Cancer Care Services wards 6AS, 5C and the Oncology Outpatients on Level 4 in the Joyce Tweddell building. Each musician was remunerated according the current recommended award. Lachlan Hawkins : Hand Pan. After explaining the project to one staff member and saying that we've just recently started playing up in Level 4-6 wards and waiting areas, the gentleman firmly requested "never stop". I thought about the phrase later as I was walking out of the hospital and the fact that both of those words are time-based. Whilst it was a firm tone, this gentleman spoke this phrase almost with a plea; it was clear not only to him but to many of the staff and patients that the music was a significant relief for them. Lachlan Hawkins [Handpan] in Ward 6AS. Played in the patient lounge today. The oncology counsellor had organised a group meeting that morning which was fortuitous. Jenny (counsellor) noted that they were going to be on weekly at 9.30 on Friday mornings. It is a little difficult to hear conversations about the tough journeys these people are having, but I hoped the music calmed the mood. Jenny seemed very receptive to it and I received thanks from a few people, so I think that was the case. I might try some slightly livelier tunes next time. What is it about live music, selected carefully and played sensitively that evokes such a range of emotions and responses? From family members feeling as if they have a new core of calm to staff members selecting to sit in a more comfortable chair next to the hand pan player to write reports, this project has easily convinced many people that it is a game changer. As with any innovation in the public domain inclusion into policy and budget considerations must be based on thorough research outcomes. Measuring emotion, improved recovery from cancer treatment and a new sense of staff morale require complex and reliable research methodology. Our intention is to continue pro-bono performances to the extent that musicians' are available. We are keen to see a combination of funded research via Griffith University's Queensland Conservatorium's Centre of Research and funded performances for our professional musicians in the strong hope that sooner rather than later innovative programs like The Stairwell Project will form part of both health care policy and budgetary planning.